After making Coconut Chocolate Chip Macaroons, I started thinking about making chocolate macaroons. Everything’s better with chocolate, right? I thought about the best way to do this, so experiment one was to use cocoa powder instead of using melted chocolate. The results were tasty, and my guinea pigs were guests at a 6-year-old birthday party. The plate wasn’t totally empty by the time we left, but there had been birthday cake, and there were very few macaroons left that I felt confident this recipe is good. At some point, I’ll probably try this recipe with melted chocolate instead of cocoa powder. I usually have cocoa powder on hand, so wanted to try that first. Preheat oven to 355 degrees. Line baking sheets with parchment paper. In a large mixing bowl, combine the milk, vanilla, salt, and coffee powder. Once these ingredients are well combined, add in the cocoa powder. Mix thoroughly. Add the coconut, and stir to coat. Add the chocolate chips, and combine. Using two teaspoons, two tablespoons, or an ice cream scoop, portion out cookies. On a half-sheet pan, I usually get 5 across and 6 down when I use the small ice cream scoop (30 per sheet pan). This recipe fills two full, and one partial, half-sheet pans. I occasionally make 5 or 6 large cookies, just to speed up the process. I find that a mix of small and large macaroons on the dessert platter look inviting. I tried an experiment using a mini-muffin tin. You’ll notice that a few of these have a cup shape, versus the mound shape from those cookies baked on parchment. 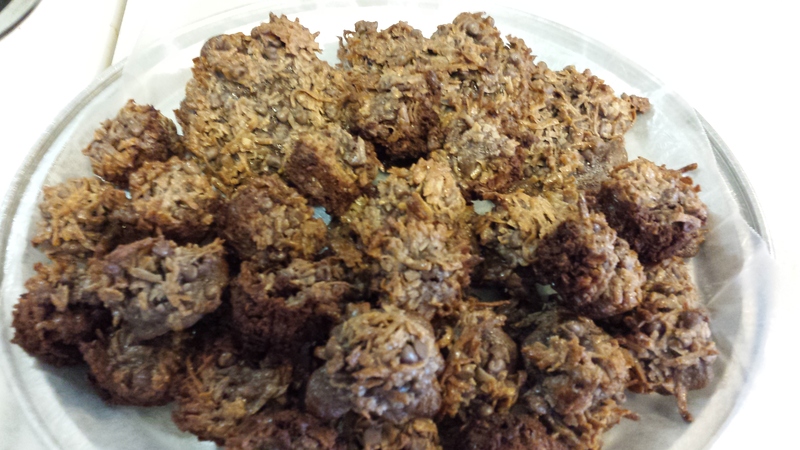 I liked the taste (these came out chewier), but it was harder to get them out of the muffin tin. I used a chopstick to loosen the edges, and some came out easier than others. Those broken macaroons were used as quality control samples (my husband and I enjoyed them).